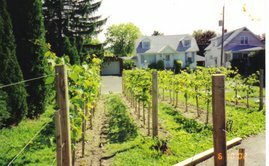 Backyard Vineyard & Winery: Welcome to Backyard Vineyard & Winery! Welcome to Backyard Vineyard & Winery! My name is David Ruzzo. I have been making wine with my best friend Rich Schell for more than 15 years. I have loved wine as long as I can remember. My grandfather (Papa), an Italian immigrant used to make wine in the "traditional Italian" way every year. back in 1991 my friend Rich noticed a heavily laden concord grape vine that ran between my yard and my neighbors. 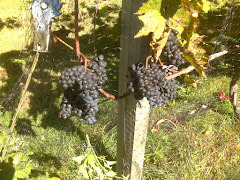 I never paid the vine much attention, but one September day he said "we should make wine with those." Thus began the quest, how to begin, how to do it and so on. My grandfather had been dead for years and my father viewed wine making as a chore since he was forced to help Papa each year when as a teenager he would have rather been playing basketball with his friends. So Rich and I bought books, picked minds and did everything one could do in the days before the Internet, to find out how to make wine, and we did. We turned those Concord grapes into the worst batch of whatever we had ever tasted! That was just the beginning, we learned about varietals and started purchasing classic varieties imported from California and have made many vintages during our yearly ritual. When my father's oldest brother heard about my endeavors, he called and asked if I wanted Papa's Torcietti(winepress) and other equipment, since it was sitting in his basement gathering dust. I never knew it existed, but Rich and I immediately went and picked it up and we've used it ever since. It stands 5' tall and works great. It's my tribute to Papa and reminds me that my winemaking is genetic. Upon purchasing a fixer-upper home in 1999 I was surprised to find out that an overgrown extra plot of land came with it. I eventually cleared up the thickets and planted a nice large tomato garden. One day as I stood looking at my garden noticing just how much sun it received, when it suddenly hit me. I thought to myself "I think I'll plant a few grapevines here to make wine from." Little did I understand the implications of that statement. Living in the Northeast in upstate New York, I had no idea about what varieties grew and where. What types of wine were made form which grapes, and the word terroir, huh? As I began to research viticulture, I slowly realized I had bitten off more than I could chew. Nevertheless, I persisted and successfully planted 40 vines in the spring of 2001. "VillaRuzzo Vineyards" was officially underway. Since then I've added 50 more vines, removed two of the original 4 varieties, and learned the challenges of growing vinifera grapes in cold climates. I learned a lot and lost a lot, but I have realized my dream of making wine from my own grapes. It's getting better with each vintage and I continue to get excited with each budbreak and harvest. I have a lot to share, but a lot more to learn and that's what I hope to accomplish by means of this blog. I hope to create a place where home grapegrowers and winemakers can share their failures successes and tasting notes. Hope you'll share yours with me! Dave, many of us are growing grapes where we're not supposed to. I'm here in the foothills of Colorado at 7300 ft. You can check out my little research vineyard at: Rist Canyon Vineyards. Good luck with your endeavor. You've got a wealth of information on your site! It looks great. That's the kind of information I'd like to try and include here along with my personal observations in trying to make good wine from my own grapes. Best of success to you! I'll link your website here. Nice page so far. Remember to tell people to be patient. Time heals many Zins, but also drinks them too early! Remember all that we learned with that first batch? That's what alcohol smells like... That's what foooonk smells like... then, that's what sulfur smells like... Can you put video here? I have some good pressings munching taped ;-). Later.